We will test it. Any news I will let you know. 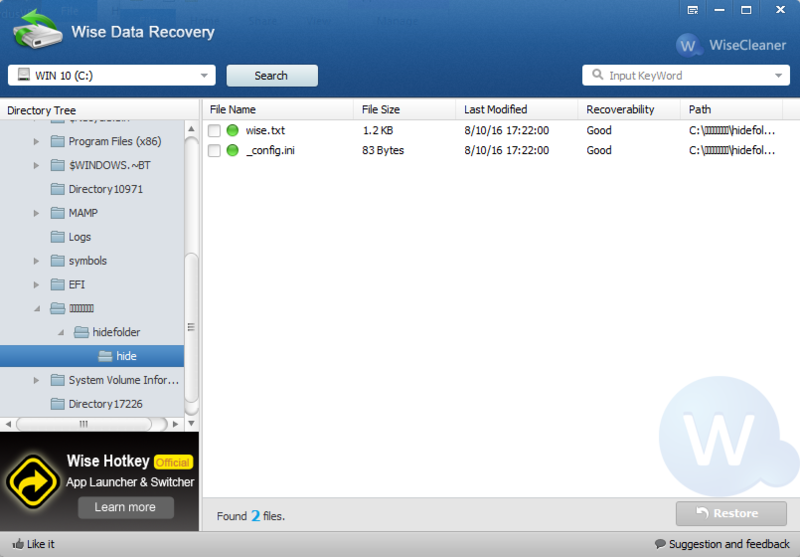 By the way, we have two different Wise Data Recovery. One is original, used to recover deleted files. everyone can download it from our website Download Center. Well I've tried both versions now and the older version can see my drive too just when I click on it to searvch I get the same error as I'm getting with the new version. I know my Seagate was searchable in the past and other recovery programs and all other Wise programs can see and use my drive. I am completely stumped. Did my information about my drive help at all? I have also lost visibility of my hidden folder after the last WFH update. I also have a Seagate drive over 2Tb and receive the "Can Not Get Disk Information" error when attempting to search with the WDR tool downloaded via the support links to recover lost hidden folders. No recovery tool mentioned in this thread has found my hidden folders, no errors are logged by tools or the drive. It appears as if the large Seagate drive is outside scope of WFH and WDR operation. I have a 4Tb USB 3 external Seagate "Backup Plus" (Model SRD0SD0, PN: 1DXAP4-500 4 Tb). I've attached the drive to a Win 8.1 PC as well as the Win 10 PC on which WFH was originally installed; both operating systems have identical issues with the hidden folders and WDR. I need to find those folders, please update WFH ASAP to remedy this issue. Belay that, the folders had been unhidden and moved. Just a communication gap on this side; apologies for the inconvenience. Simply "Un-Hiding" solved the "Folder is Empty" error for me. Shortly after I had upgraded from an older version of Wise Folder Hider to Version 4.11.143, everything was working fine, then one day I opened the program as normal, but when I tried to view the files, it said "Folder is empty." I tried all of the various methods described in the help files, but Wise Data Recovery showed no files in the [[[[[[[[[[... folder, then quit showing the [[[[[[[[[[[[... folder at all. Finally, after rebooting, reinstalling, pulling out significant amounts of hair, sending desperate notes to the WiseCleaner staff, I happened upon a simple solution. In the main WFH screen, rather than selecting "Make Visible" I selected "Un-hide." Boom! There were all of my files. I went through and un-hid each folder, and all of the files appeared and work fine. I will back up the files and try hiding them again, and see if the problem returns. I used WFH for several years with no problems. I have no idea what might have happened to make them suddenly inaccessible, but I'm very relieved to have recovered my files. This is an known error of Wise Folder Hider 4, we have fix it. Please download and install the latest one. thank for all ur tips but i still can not delete those folders.is there any other way? It's frozen for over an hour as in the screenshot even though Scan finished. Can I get some help? 1. Unzip and install the file downloaded from the link below. 2. Open the main surface of the tool, choose the drive you used to place the files hidden. Then click "Search". 4. Click on the folder named "hide", a list of files will show up in the right. This is only for wise folder hider v1, v2, v3. 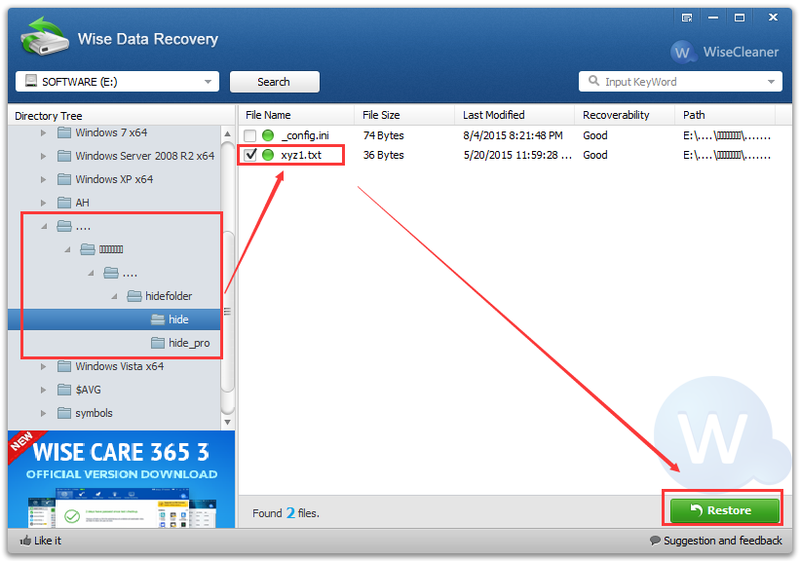 If you are using Wise Folder Hider v4, you cannot use this method to get back hidden files.